and most importantly, could run the classroom without me around. (This will be key for when I am working with small groups or one-on-one with kids). Below are some pictures of what I have done so far. This is my writing area. It has supplies on the shelf and the crate next to the shelf is where the students will keep their final writing pieces. I am creating full portfolios for the kids, but this is specifically for their writing. To the left is to keep track of where they are in the writing process. I got this great idea from www.creativechalkboard.com blog! It's cheap and effective! To get the trays to hang on the wall, I used crazy glue on flat thumbtacks and glued to the tray and then stuck to the wall. The labels were oversized library card pockets that I found for 69 cents each. I just snipped off the top, laminated, and labeled them. The mini pencils are decals that I also found at the teacher store. I laminated and will label with each students' name once I get a class list. The pizza trays are from Dollar Tree. I placed a magnet on the back of the mini pencils and the kids can move their pencil as they finish each part of the writing process. This was a great idea that I stole! Thanks so much! I plan to use Lucy Calkins' Writers Workshop in my classroom to teach writing. For the kids to keep track of their writing and the materials that go along with it, I came up with the idea for a writing binder that is divided into sections. Shown below. I printed the page, and stuck it in the front of the binder (added the owls because that is the theme of my classroom. I got those from TpT.com for free. Just search owl labels). The labels are; draft, revision, edit, publish. The plan is to have the students complete their brainstorms in a composition book and work on loose-leaf paper for the remainder of the process. 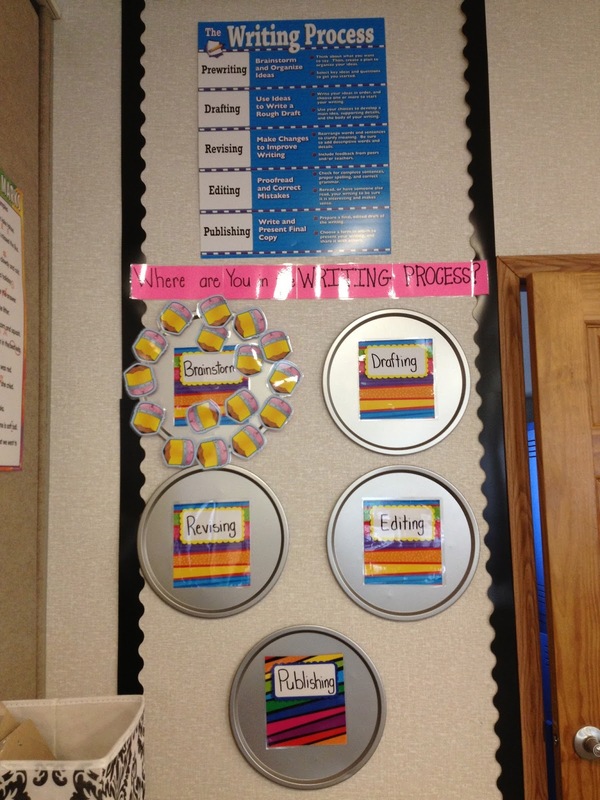 They can move the pages from section to section as they move through the writing process. The composition book fits nicely into the pocket of the binder. I am hoping that this will keep things from getting lost. I kept the classroom library pretty simple. I organized books based only on genre and some are sorted by author. I am using Lucy Calkins' Readers Workshop to teach reading. Inside each book is the scholastic reading level (A-Z). 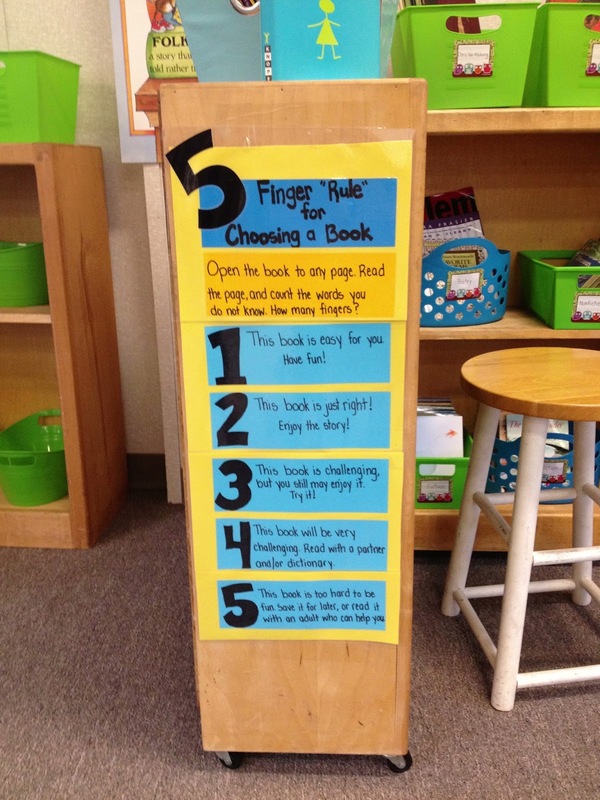 The plan is to assess their reading level the first or second week of school so that they are able to choose a "just right" book. 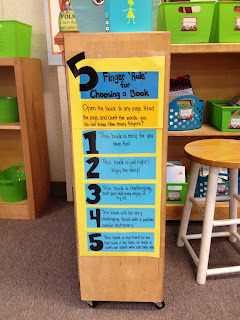 Some of the books I couldn't find levels for, so I put up the reminder of checking with the "5-finger Rule". I want to eventually add a small rug and some comfy seating, but my budget doesn't allow for the right now. Perhaps one of my favorite parts of the classroom. 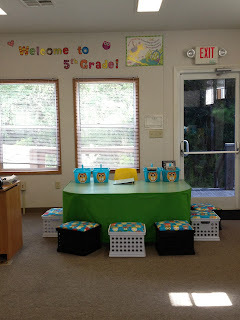 Maybe because I love to meet with kids in small groups or maybe because I made the cute little "chairs" that are around the table. Actually, during my time in Philadelphia, my school couldn't afford to buy me a U-shaped table, and if I want something, I MUST HAVE IT. So, my genius and crafty aunt and I built the table and painted it green. So essentially, I made a set of table and chairs! I searched online at a bunch of different websites so credit can't be given to just one person. However, many teachers and parents are doing this and it is genius! Learn how to make your very own Crate Chair (as I like to call them :)) here. The 4 owls you see are taped to bathroom caddies from Big Lots. 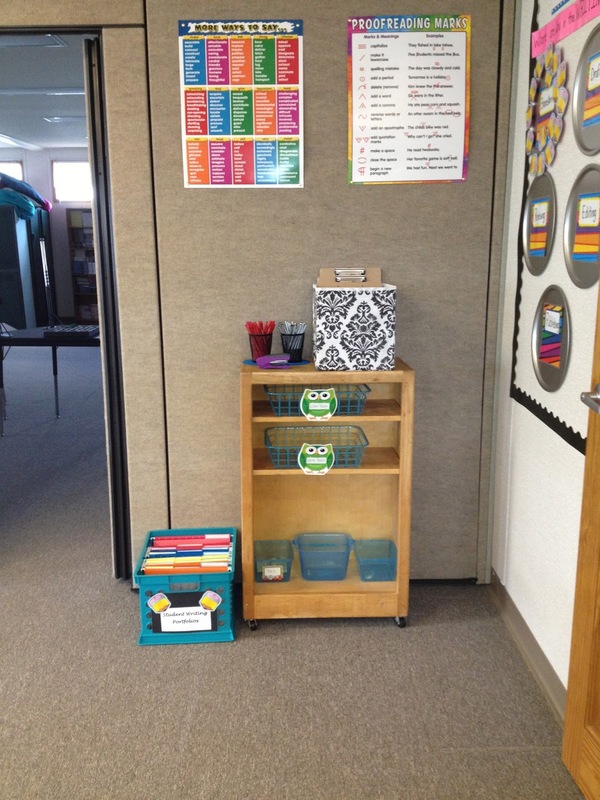 I plan to hold the Guided Reading books and materials in there for easy access. This took me about a week. I only have one week left to get the math area and some other bulletin boards done. I hope it happens in time!! Great job! I love all of the creativity and hard work. I think the students will really enjoy your classroom. Thanks!! I hope they love it!! Wow, this looks fantastic. I love the way you used the pizza trays. This will improve the idea I use and will help me utilise my space better.